The ruling political party in South Africa is attempting to amend the nation’s constitution in order to allow the free seizure of land from white farmers. President Cyril Ramaphosa announced Tuesday that it is time the expropriation of land without compensation must become commonplace in South Africa. In May, the African National Congress party said it would “test” the concept of including provisions for indiscriminate land seizure in its constitution. Now, however, it appears the party has every intention of pushing through such controversial and racially motivated measures. “It has become pertinently clear that our people want the constitution to be more explicit about expropriation of land without compensation as demonstrated in the public hearings,” President Cyril Ramaphosa said in a recorded address to the nation, according to Reuters. “The ANC will through the parliamentary process finalize the proposed amendment to the constitution that outlines more clearly the conditions under which expropriation of land without compensation can be affected,” he said. Despite the apartheid era ending a quarter of a century ago, many black South Africans see the continued white land ownership as a clear demonstration of racial inequality. Since 1994, the ANC has operated a “willing-seller, willing-buyer” model, whereby the government buys land from white farmers who are open to sell. The land is then redistributed to black citizens. But the economic threat of such accelerated action is concerning potential investors. If agricultural businesses are stripped away from skilled farmers and handed to those who are not experts in the industry, both the economy and South Africa’s levels of food security could suffer. South Africa is experiencing extremely high unemployment rates, with some 27.2 percent of the labor force out of work. Ramaphosa has admitted that the figures are “quite worrying” and has proposed a stimulus package that he hopes will kick-start the economy. These measures will include the upping of investment into the country’s infrastructure. “This stimulus package will be based on existing budgetary resources and the pursuit of new investments, while remaining committed to fiscal prudence,” the president said. Malema has been accused of inciting racial hatred, and calling people to an armed struggle against the white population. On Saturday, he was spotted firing live rounds from a semi-automatic rifle while celebrating at a political event. The EFF insisted they gun was loaded with blanks, but a firearms expert begged to differ. Mugabe’s policy of land reform had devastating consequences for the Zimbabwean economy. Between 1980 and 2008, the rate of inflation rocketed from 7 percent to 79,600,000,000 percent. That meant that in 2008, $1 USD was equivalent to $2,621,984,228 Zimbabwean dollars. In 2009, Zimbabwe was forced to abandon its currency — which had gone up in an inferno of hyperinflation — and to adopt the dollar as its principal means of exchange. The enforced dollarisation stabilised the economy and led to an initial 40 per cent rebound in incomes, though these have since flatlined. With no local currency, money supply became entirely dependent on inflows of dollars, in effect depriving the authorities of control over monetary policy. Now, as South Africa’s economy continues to flounder, Afriforum is warning that the consequences could be cataclysmic. “History teaches us that international investors, regardless of what AfriForum or anyone else says, are unwilling to invest in a country where property rights are not protected,” AfriForum’s Chief Executive Kallie Kriel said. Others are advising South African farmers to boost security measures on their property’s following the ANC’s staggering announcement. 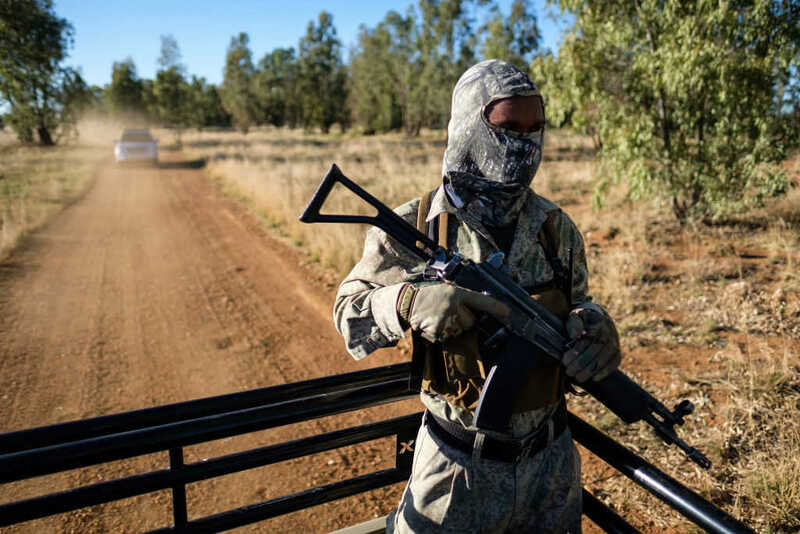 Ian Cameron, head of Community Safety at AfriForum, has released a report entitled “How to defend yourself from land grabs” to help farmers repel any unwelcome visitors. Intelligence gathering, strict access control and the utmost caution when dealing with the local police are all advised.